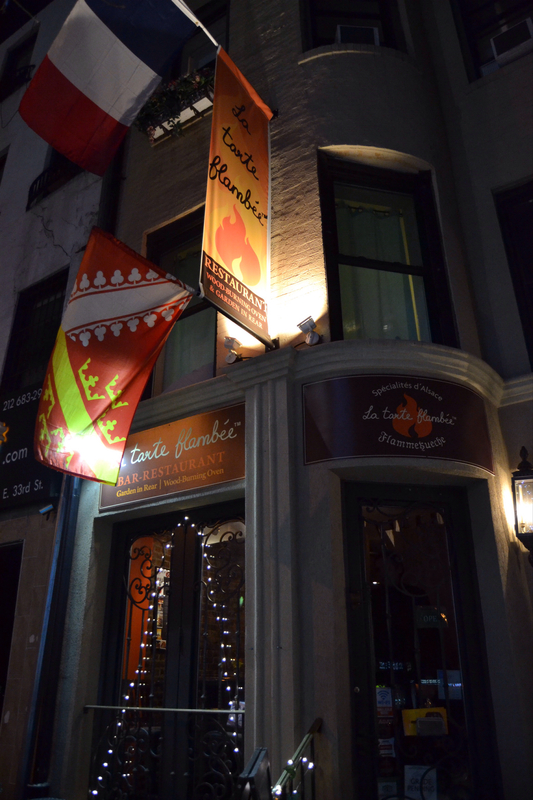 I had the chance to try lovely French restaurant, La Tarte Flambee the other night with some friends. It’s a perfect place to share a meal because the concept of the tart, a specialty of Alsace, France is a mix between a pizza and crepe. The tarts are quite large, cut into 9 square pieces and have a thin crispy crust. 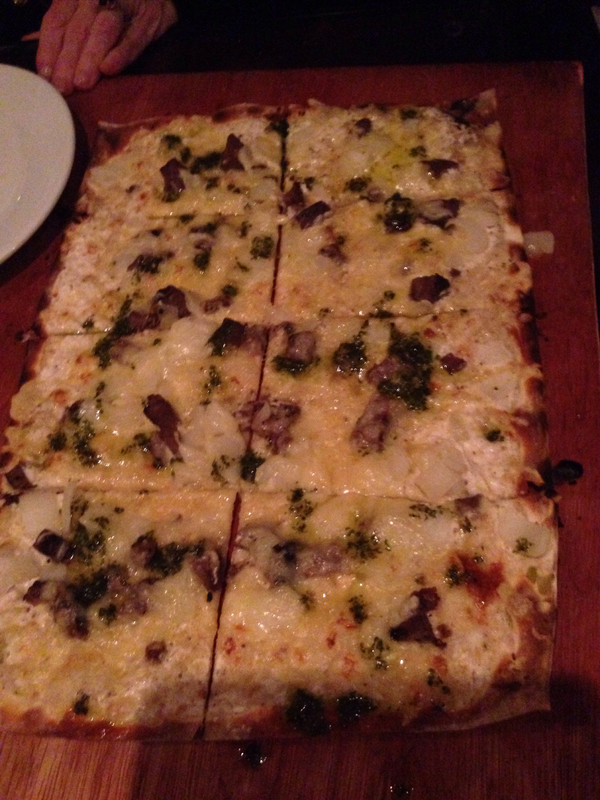 We started with savory tarts and ordered 4 of them. My favorite was the grilled lamb with onions, gruyere and mint sauce. The lamb was flavorful and tasted wonderful with the onions and cheese. The mint didn’t have a strong presence on the tart but I didn’t mind that. 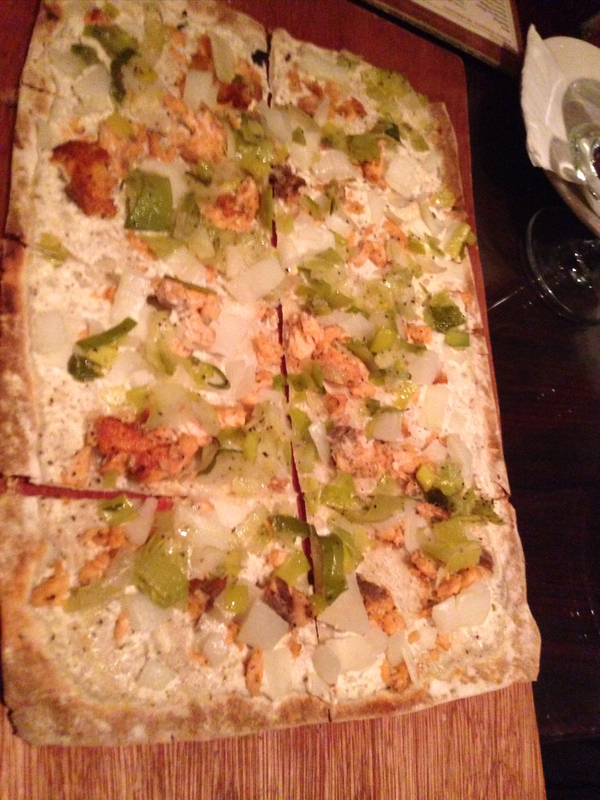 We also ordered a tart made with fresh salmon, leeks and onions. The salmon was indeed fresh, as were the vegetables. 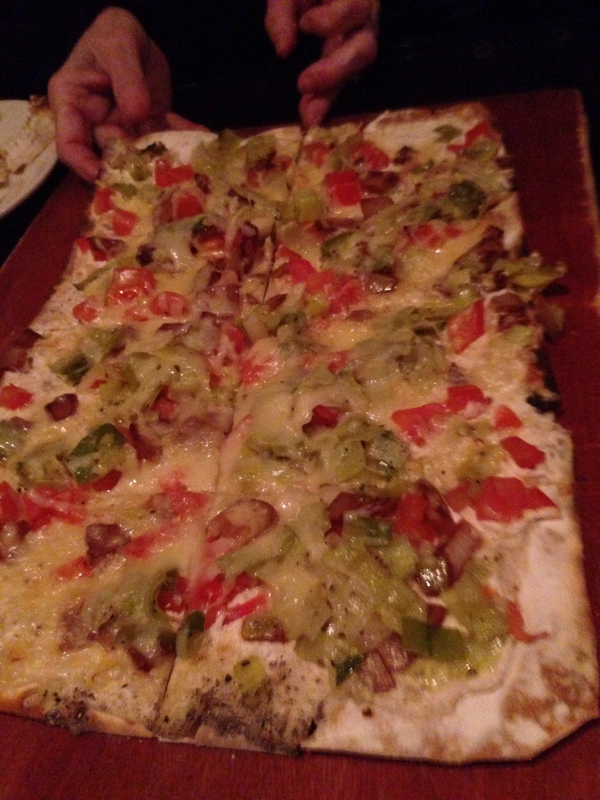 Next, we had a vegetarian tart with leeks, tomatoes and peppers, as well as cheese. This was quite good, even with the absence of meat. 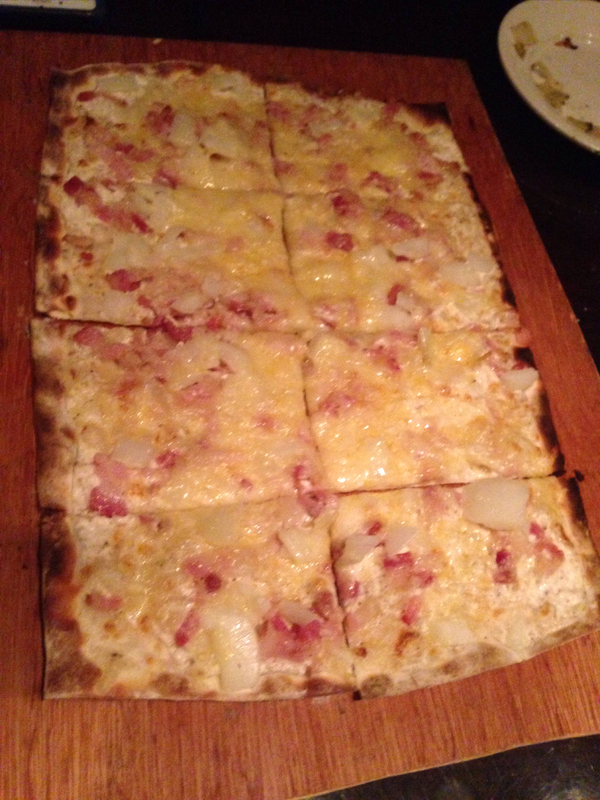 Last we picked a tart with bacon, onion and gruyere. It was a bit light on the bacon; it would have been better with more bacon. I also would have liked the bacon to be crispier and a little more flavorful. After that, we moved on to the sweet tarts. I, of course had to order the strawberry-chocolate one. 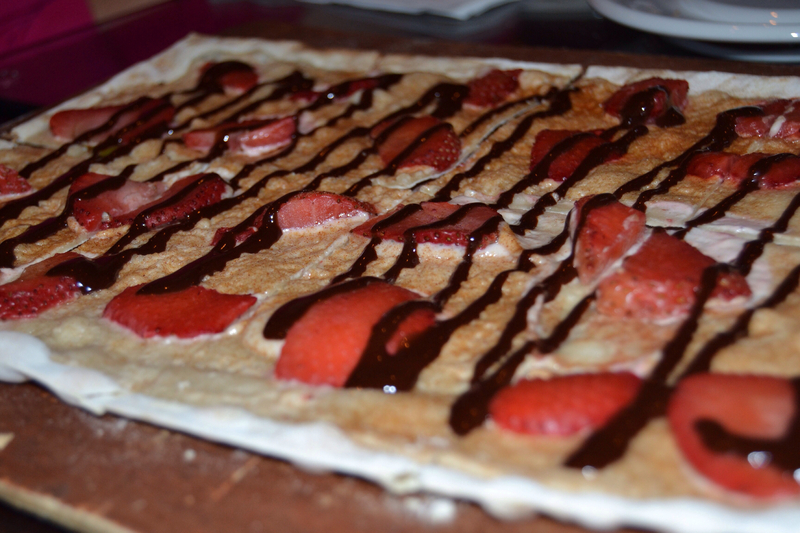 It came with creme fraiche, cinnamon, strawberries, and homemade chocolate sauce. I enjoyed very much, but think that there could have been more strawberry—perhaps thicker slices, because the other flavors kind of overpowered the fruit. I did, however love the chocolate sauce (of which they provided extra), which was rich, sweet and delicious! On the tart itself, the chocolate was lightly spread but I added some of the extra sauce and it was oh-so creamy, thick and intensely chocolate-y! 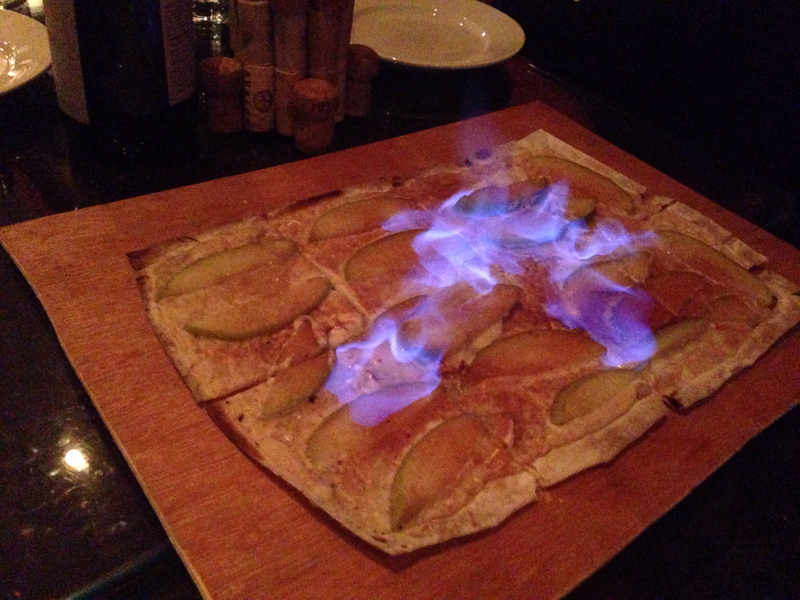 Last, we tried the restaurant’s namesake, pomme la tarte flambee, which consisted of sliced apples, cinnamon and crème fraiche and was actually flambe’d in front of us! Flambe, meaning covered with liquor and set alight which they did not once, but twice for good measure. The show was quite cool and I enjoyed watching the tart alight with fire. However, the taste of alcohol was too strong for me so I didn’t actually like the tart. All in all, I was impressed by the different tarts and truly enjoyed trying them. I would recommend the lamb one, the salmon one and the strawberry-chocolate one.